Great summary from Davids school of hard knocks. I must point out his tubular shafts that twisted were driveshaft tubing which is too light on tubing wall. The diff is a big torque multiplier and you need to do some simple maths with your ratio when calculating a tube wall thickness. Then throw in a factor of safety (FOS) on your numbers. Use seamless DOM mechanical tubing. Then there's 3159, do we know what diff or upgrades that was running or were even available? I'd have to see the specs of the tubing. A quick calculation comparing the solid shaft to a 2.5" x .075"W tube shows their (theoretical) strength to be nearly identical. Any imperfection in a thin-wall tube can reduce its ideal strength by a whole bunch too. Failures will almost always start where there are non-uniform anomalies in the structure. The smaller-diameter shaft has another advantage: It is more torsionally flexible, reducing the maximum stress on all the components in the path. I have asked the same question on the tubing for the rear drive shafts. A collegue of mine designs the shafts for gkn here in the uk. He has told me that 3 inch tube is no stronger then the old dog bone steel shafts. Its the uj that will go first, on the dogbone. You know, from just eyeballing them, the solid shafts seem stronger. I don't remember seeing any pics of these twisted or broken. It's always the stubs, or the u-joints, which I believe are Spicer 1410 here on mine, that go. Last edited by patrickt; 10-25-2016 at 10:29 AM..
That axle looks solid, but it is actually tubular, although made from very heavy tubing. It's about 25% stronger than the solid shaft. It's odd that I don't ever remember anyone fabricating small diameter, heavy tube half shafts for old, high HP 63-82 Corvettes. They are know for suffering their share of half shaft and U-joint failures over the years, especially with sticky tires. When I tore down my 66 427 Vette to restore, I found one of the half shafts on it had started to twist - fortunately it had only gone about 5 to 10 degress however. Usually the racers or big HP guys migrate from the original 2-1/2 dia shafts to the later 3 inch half shafts, or spend some money on some custom, large diameter tubular ones. Has anyone broken any rear end parts anytime other than at launch with sticky tires? Yes, I wiped out the spider gears, which seems to be a somewhat common occurrence. Thats interesting. If it didn't happen when launching from a standing start, was it when releasing the clutch on a gear change or just rolling on the throttle in gear? For the half shaft it's diameter what counts. But your shocks get in the way soon. My buddy twisted the XJ half shafts often until he used some that are dimensioned similar to Corvette shafts. My car had more torque, but I ran street tires - occasionally Hoosier Street TDs on public roads, never on real drag strips. Mine was also very light which helped (920kg). Look what CAN-Am cars use. Amazingly thin control arms and reasonable diameter half shafts. I am not near one to measure. As long as you continue to run U-joints in an IRS setup that adopts unequal angles in the UJ's at any point in the suspension travel when under acceleration load you run the risk of failure in the spider gears or splined stub output shaft from the diff, further to that if the halfshafts are light enough in construction/material that the UJ's can get out of phase due to twist then the UJ's are also likely to fail along with increasing the amount of load the stub shaft will experience. 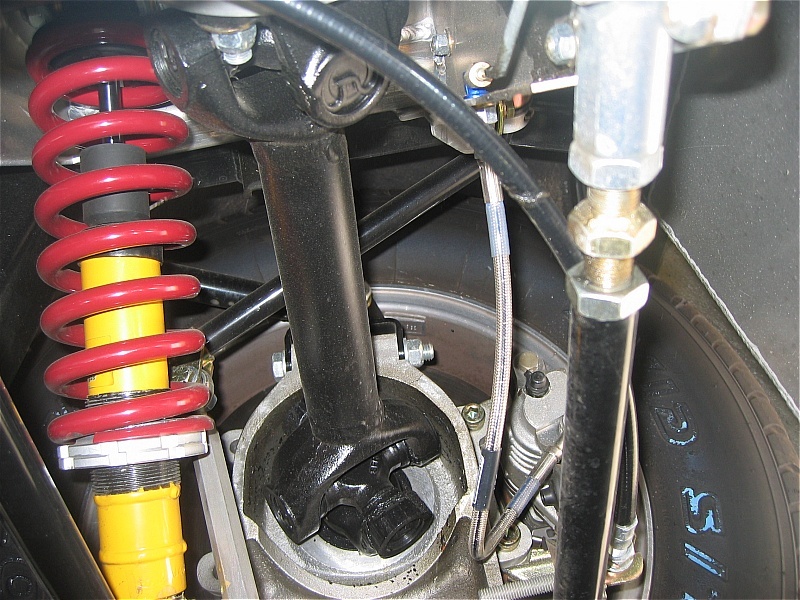 Half shafts that use CV's are actually able to twist like a torsion bar without inducing the mechanical bind that occurs in UJ types.... essentially acting like a shock absorber in the driveline. I have the 4 spider version. I am not sure if the spiders took out the side gear, or the side gear took out the spiders. I had 4.56 gears in the car at the time, so it wasn't really hard to break the tires loose going straight or around a corner. There was no 1st or 2nd gear. I did not even know they were broken until I drained the oil and a chunk fell out! There are guys on another forum I visit that are using C5 (I think it was C5) Corvette IRS set-ups that are all aluminum. They are running 1000hp on a turbo LS engine and they seem to hold up. Last edited by joyridin'; 12-12-2013 at 04:29 PM..
does anyone know who the brake setup is from on this custom irs ?? I am in the same boat with a 800hp big block. I don't know if it's worth the hassle to stick with the weak and dated Jag IRS. The only manufacturer that has upgraded parts is ERA. Sure, the real cobras had it but my reality is all these replicas aren't. I rather have a reliable IRS without the type of Clutch I want to use, I drive how I want to drive not the drivetrain telling me to back off. I am not passing this project as the closest Cobra to the real thing. It's about dependable, high octane enjoyment. If a Vette, Stang, Camaro can have fun on the strip, track and street why can't I just have fun my Cobra replica like them? At this point, I am deep sixing the idea of the Jag.. big flags. You will have an extremely hard time breaking the package or any of its components. When you order the axles GForce will tell you how to measure for the half shafts. Follow their directions and you will be quite happy. I called MW about the upgrade for the Jag. He gave me the information and two paths to take; use existing spline count or increase to 30 and convert to CV. The latter sounded the way to go however, the price shot up to near $5k...I did ask What he thought the power level it could hold. He said he wouldn't guess since it's a Jag rear but perhaps 300-400.. I am assuming per axle. Who knows..
Then I started thinking about the other IRS systems out there because if you really think about it, a balls out straight axle is near $10K. The other IRS systems typically just need the CV axle upgrades. The stuff I laid out in post #36 easily handles 750 WHP in 3,600 / 3,800 lb 03/04 Cobras. Less horsepower in a lighter car is a walk in the park for this type of IRS build and significantly, the price comes in well below your $5K target above. The one item I left out of the list was the billet steel differential caps from Mark Williams. They are about $170 per pair => MW 8.8 Main Caps You will also need the outer knuckle kit which you can fabricate or buy from Ford's FRPP unit. p.s. I have never heard an axle's rated power level represented in a per axle fashion. I believe the 300/400 power level representation was for the assembly and not per axle. 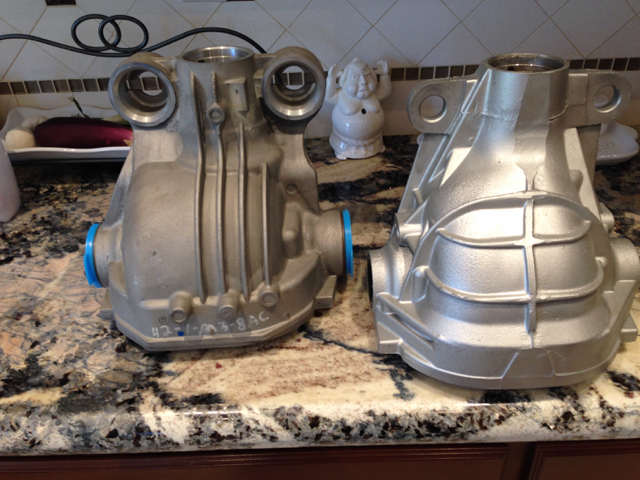 The power level most likely has to do with the use of OEM quality parts throughout the Dana 44 build. I put took mine and put int a Torsen style differential, 3.70 gears, and 30 spline axles. The brakes were upgraded to 11.5" and the axles are now 2.5" diameter. I have about 600 hp with no problems. My only concern is the outside quarter shafts, so I am looking into those. Depending on the width of your rearend, there may be a lot of options. If you really want something bulletproof, you can buy a 9" IRS center section and build from there.